Security researchers from Symantec have spotted a fake browser plugin-in currently circulating in the wild. The scenario is very simple: the victim is lured into watching some video; but instead of asking the victim to share/like the video, (which we have seen in many scams) the scammers present the victim with a fake plug-in download image, which is required to see the video. Once the end users are tricked into installing the fake YouTube themed browser extension, their User-Agent info is retrieved and accordingly, the fake plug-in is downloaded. For the time being, only Mozilla Firefox and Google Chrome plug-ins are being used. 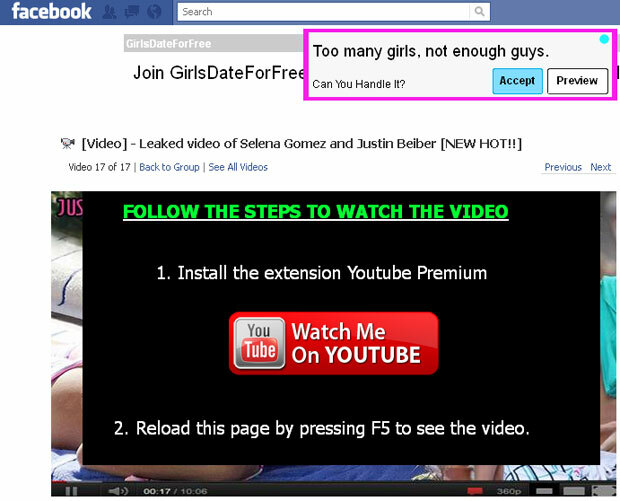 The scam is currently circulating, using the [Video] Leakead video of Selena Gomez and Justin Beiber [NEW HOT!!] theme. Scammers are always looking for different techniques to lure users . Facebook users are advised to be extra vigilant when interacting with content shared on the most popular social networking site.